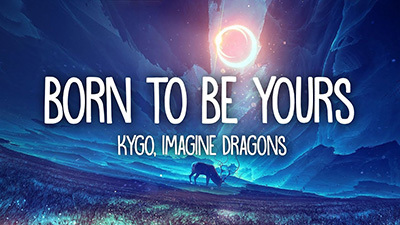 "Born to Be Yours" is a song written and performed by Norwegian music producer Kygo and American band Imagine Dragons. Produced by Kygo, it was released by Sony and Ultra Music on 15 June 2018. "Born To Be Yours" is broad sweeping radio rock with a hint of folk. Hand claps and acoustic guitars shape verses over a chill electronic beat, and when the hook hits, it comes in coconut flavored in classic Kygo fashion.